The Center for the Digital Arts at Peekskill is an artist’s space and a friendly environment in which to work. The Center hosts five Apple post-production studios including two video labs, an animation studio, and facilities for other digital projects. 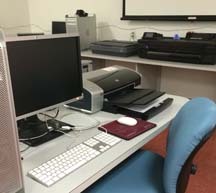 The studio also offers large format printing, 3D MakerBot printers and 3D scanners for use by artists enrolled in this program. This package is for the professional or aspiring artist with competent computer skills who wants to continue to develop a portfolio and use the Center’s resources. Choose daily access fee or package fee. Note: Interview with Technical Support Manager required. CE-DGART 2003PE, Package Fee $313. M/T/W/Th, Sept. 8-Dec. 21, (skip Nov. 22-24) 9:00 am-9:00 pm and F/Sa, 9:00 am-4:00 pm, #83330. CE-DGART 2050PE, daily access subscription fee $27 per day. F/Sa hours are 9:00 am to 4:00 pm. The Center is closed Nov. 22 to 24.